CP 50 Resting ECG Monitor, by Welch Allyn is a high-grade, easy-to-use ECG Monitor that offers speed, simplicity, and advanced connectivity, designed to provide the best patient care, all at an affordable price. The CP 50 provides fast ECG readings with the touch of a button, while reliable, easy-to-read on-screen instructions help to ensure accuracy during use. It also features a flexible range of advanced connectivity features to help in sending, managing, and sharing patient data with other systems either inside or outside of your facility. The CP 50 Resting ECG Monitor features an optional mobile stand and carrying case, as well as convenient battery operation, to increase and facilitate portability. The high resolution thermal printer and programmable report formats combine for efficient, hassle-free patient care. 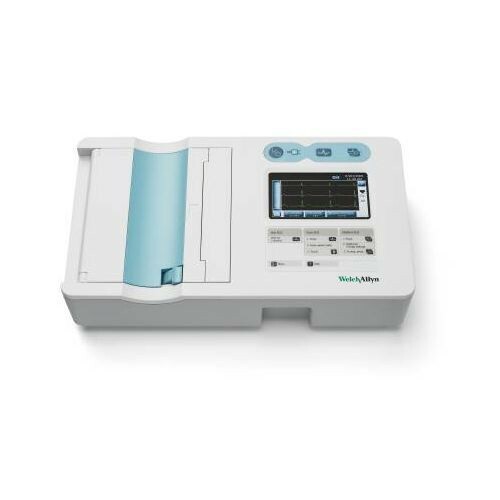 Vitality Medical also carries other Electrocardiograph Monitors, such as the CP 150 Resting ECG Monitor and the MAC* 2000 Resting ECG System. Reliable, Color Touchscreen Display Improves Staff Satisfaction. Optional MEANS Interpretation for Improved Patient Care. Battery Operation Lets You Easily Transport Your Device to the Patient. Programmable Report Formats That Fit Your Needs. Optional Mobile Stand and Carrying Case For Maximized Portability. Internal Storage of ECGs Results. On-Screen Instructions That Guide You Through a Test, Improving Efficiency.